There are a lot of unknowns regarding Night in the Woods when it comes to the trophies/achievements and collectibles. The sketches you can find throughout the game only unlock when viewing certain events. Some of these happen automatically during the story, but the majority have to be worked for. Weird Autumn Sketches have not been added as of yet. They do not affect the ability to get the ‘Seriously?’ trophy. #1: R.I.P. Granddad – Automatically added at beginning of game. #2: You’re Parents Forgot You!!! – Automatically added at beginning of game. #3: Mom – Talk to mom before leaving the first morning. #4: Eels – Added after talking to mom numerous times on the first morning. #5: Dead Bird – Talk about murders w/ Mom. #6: Jenny’s Field – Visit mom every day at the church (after it opens) and agree to go on trip w/ her to Jenny’s Field when asked. #7: Dad Looks Older? – Talk to dad first night after coming home. #8: Still Funny Though – Adds on second night after talking a few times. #9: Meats – Go grocery shopping w/ Bea at the Ham Panther. #10: Dohr & Castys – Look at stars through telescope for the first time on the day after the wood’s party (use telephone wires to get onto roof). #11: WoOoOo! – Examine laundry on building roof in second area on day 2 (to the left of Bea’s apartment. Use telephone wires). #12: Hello Bea – Examine statue on Bea’s apartment via wires. #13: Pizza Scale – After first band practice during pizza scene w/ friends. #15: Angus – Talk to Angus about fixing your laptop. #16: Germ – Meet Germ for the first time near the Snack Falcon. #17: Never Drink Again – Automatic after Wood’s party. #18: Everything Feels Bad – Automatic after Wood’s party. #19: Die Anywhere Else – Complete first band practice with an “OK” score. #20: Weird Autumn – Complete second band practice with an “OK” score. #22: G-Dad – Examine bookcase near birdcage the morning after Wood’s party. #23: Eff the Cops – Talk to Mom about walking on power lines. #24: TA-DA! – Selmer’s after the Wood’s party; listen to her poetry everyday. #25: If I Die – After hearing Selmer’s speak in the Poetry Club while at the library w/ Bea. #26: Mysterious Tooth – Find tooth in basement safe (after boxes are moved from crawlspace). #27: Workin’ – Go w/ Bea on her house call. #28: Ham Panther Dinner – Have dinner w/ Bea. #29: Sterling & Simone – Second time you look at stars on roof. #30: Big Snake & Gramercy – Third time you look at the stars on roof. #31: Mallard – Find Mallard the duck in the third area after the light pole is fixed. He is inside the open window you can access via the power lines. #32: Miracle Rats – Feed the rats inside of Mallard for the first time. #33: Roofcat – Climb to the top of the building next to Lori (on her right) and interact w/ sleeping cat. #34: Nuke Possum Springs – Inspect the Subway mural after it’s been vandalized. #35: Honey I’m Horm – Talk to fisherman in subway station after Wood’s party. #36: Pastor ‘K’ – Meet Pastor K for the first time after the church becomes available. #37: Fire Statue – Inspect statue near church when it becomes available. #38: Smash! – Smash light bulbs w/ Gregg on Halloween (Harfest). #39: Bruce – Meet Bruce for the first time. #40: Smooshed Soldiers – Go w/ Lori to the train tracks after talking to her for a few days on roof. #41: Smooshed Together – Return to tracks w/ Lori for a second time. #42: I Freakin’ Died – Hang out w/ Gregg and build the robot. #43: Crimes (Bunny head) – Go w/ Gregg to commit crimes. Choose rabbit head when asked. #44: Crimes (Frog Head) – Go w/ Gregg to commit crimes. Choose frog head when asked. #45: Crimes (Pig Head) – Go w/ Gregg to commit crimes. Choose pig head when asked. #46: Bandit Queens – Go w/ Bea to the mall. #47: Lori M. – Hang out w/ Lori three times and go to train tracks w/ her when she asks. #48: Parking Lot – The first time Germ asks to hang out say yes. #49: Bridge – Hang out with Germ the second time he asks. #50: Forest God – Hang out w/ Gregg for a third time. #51: Legends – Go w/ Gregg and Angus to Donut Wolf. #52: Pumpkin Head – Complete 3rd band practice with at least an ‘Ok’ score. #53: 3 Weird Teens – Visit the cliff by the church on Halloween to find 3 teenagers sitting there. Talk to them and choose ‘ A Sunken Ship’ and they will tell you about 3 pentagrams you need to find. #54: Pentagram #1 – When you get access to Gregg’s apartment roof, go into the building where the saxophone player is sitting. To the far left is a paper on the wall with the star. #55: Pentagram #2 – This one changes depending on who you go with on your final hangout. If you go w/ Bea to the second party then talk to the girl at the far right. Hold hands and you will see the symbol. If you go w/ Gregg to Donut Wolf, order the Doomnuts. There should be a donut w/ the symbol on it. #56: Pentagram #3 – Happens automatically when going through the ending. #57: Janitor – You’ll get this sketch if you talk to the janitor during the Epilogue near the statue in town. #58: Ghost – After seeing the ghost on Halloween. #59: Black Hole – After seeing the ghost on Halloween. #60: Halloween – After changing into your costume. #61: Harfest – After changing into your costume. #62: Kol & Adina – Fourth stargazing adventure on the roof. #63: Erskine – Fifth and final stargazing adventure. #64: Hella Birds – Visit the Saxophone player in the hidden stage when you get access to Gregg’s apartment roof. #65: Musicians – Visit the hidden stage after uniting the two musicians. #66: Angus is psychic – Go w/ Angus on a ghost hunt. #67: No Clues – Go w/ Angus on a ghost hunt. #68: Trash King Rabies – After meeting Rabies w/ Germ, go sit on bridge outside of town and see Rabies again. #69: Bad Art – Go on a ghost hunt w/ Gregg. #70: Skull Hole! – Go on a ghost hunt w/ Bea. #71: Shapes – Complete part 4. #72: Vortex – Complete part 4. #73: Gregg Rulz – Meet Gregg for the first time. #74: Bea – Ask Bea to drive you to the party. #75: Big Skeleton – Inspect statue in the middle of town on first day. #76: Aunt Mall Cop – Talk to Molly outside of your house before going to the Woods party. #77: This place is falling apart – Examine the church steps before they are repaired. #78: Bombshell – Do the secret handshake w/ the hot girl at 2nd party. #79: MaeDae BeaBea – Go to second party w/ Bea. #80: Demon Tower – Beat Demon Tower. #81: Pale Cat – Acquire Pale Cat trophy / Achievement. #82: Die Anywhere Else Fail – Miss 50% of song notes. #83: Weird Autumn Fail – Miss 50% of song notes. #84: Pumpkin Head Fail – Miss 50% of song notes. #85: Bea & Mae on Car – Follow Bea’s friendship quest. #86: Pizza Buds – Follow Gregg’s friendship quest. #87: RIP Casey – Learn the truth about Casey. Didn’t see it on here (or in my own playthrough) but you can get a RIP CASEY page and a sketch of Bea and Mae on Bea’s car. Just saw it on SwingPoynt’s playthrough on YouTube. Awesome thank you! I’ll go check it out. 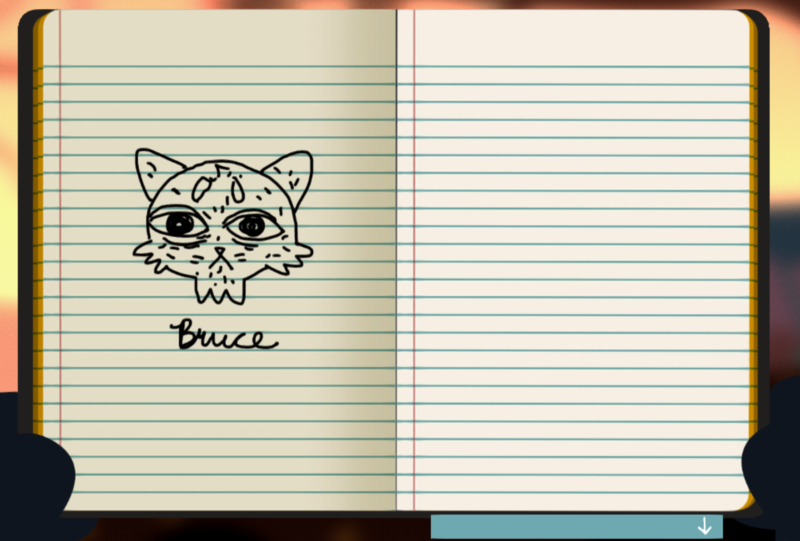 Received a sketch of Bruce that I actually missed on my first playthrough! Obtained after meeting both him and Pastor K on the first day that the church is accessible; both of their sketches were registered then. I imagine I missed it on my first run through because I forgot to go to the church on day one, so it must be a time thing? May I add the pic of your sketch to the blog post? I have a few issues trying to get sketches. I’m not sure if I’m doing something wrong, or if it’s bugged. Playing on ps4, so currently the echoes trophy is impossible to obtain, cleared the game twice and haven’t gotten it even though it’s unmissable. ANYWAY, once the stairs are fixed, I can go to the roof, but no matter what day it is, I can’t seem to interact with roofcat. And if it’s the roof itself you’re interacting with, I receive no sketch when doing so, the same applies when getting mom to talk about murders, I don’t get the dead bird sketch. Yes, all of the problems you’ve mentioned happen on every PS4. The developers have not yet patched the PS4 to fix these issues. They say they’re working on it though, so fingers crossed! thank you so so much! I wasn’t sure what to do! There’s a small comic you get when you examine the statue on the building in the 2nd screen. Found it on the first day. I have a question, the two sketches of Mae, Gregg, and Angus eating pizza and Bea and Mae sitting on the car, how do you obtain these one’s? Do you have to completely finish their quest or do a certain mission? I play on PS4 so it is most likely bugged for me so I just want to know ahead of time on how to receive said trophies. Sorry it took so long for me to respond. Yeah they are still bugged on the PS4, but you obtain them by finishing up their friendship story-lines. I don’t think there is anything extra you need to do, just get all of their scenes. Since the new updates, there’s been at least one new journal entry that I’m aware of. There may even be more. You can get another Germ page by talking to him a few days after the possum meeting. (I think this was on day 6?). He will invite you over for Sloppy Joes and you get to meet his family. if you practice your bass in your room and play “space dragon” you get a page in the notebook. On my first playthrough, at the end I found the sketch of Bea, Angus, Mae, and Gregg sitting around a fire (possibly Longest Night?) with stars drawn above it, at that part at the end where you can look at all the sketches. Also when Germ invites you to his house to go on his trampoline, you get a sketch saying “Germ’s got a whole family” and “Sloppy Joes”, and also a sketch of Germ’s grandma.